"Residential Project of the Year-Attached"
"Best Attached Community 12 to 18 DU/AC"
The Ziani site plan illustrates the configuration of two seven-plex buildings to form a courtyard. The motorcourt forms the heart of two companion buildings and front door entries occur along the outer perimeters. A variety of plan forms are blended into the motorcourt configurations and the diversity of floorplan types widens the market audience. 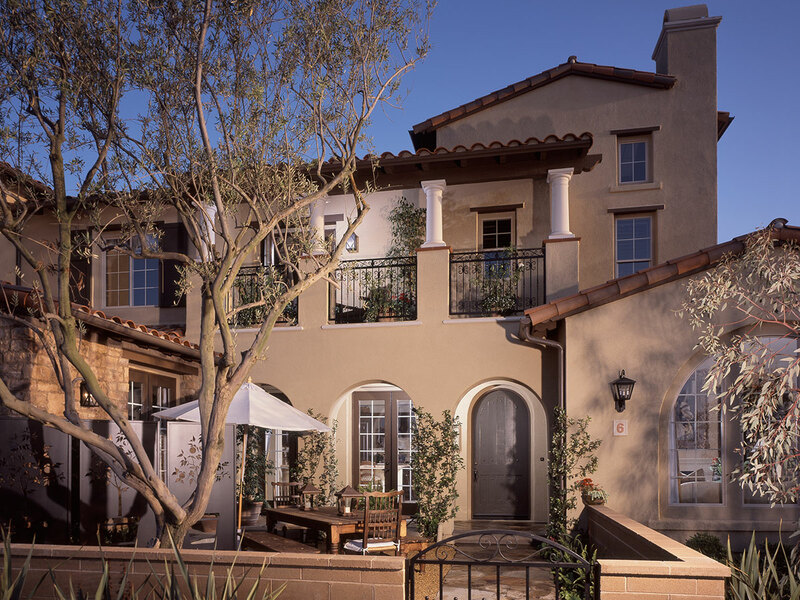 The floorplans consist of traditional two-story townhouses, carriage homes, flats, and three-story townhomes. A passageway between the two seven-plexes allows entry into the motorcourt. Architecture is critical in the motorcourt and a variety of primary and secondary roof shapes, in conjunction with projections and balconies, ensures a rich architectural statement. The three-story elements create vital undulation and movement, which is pivotal in replicating the Tuscan hilltop character. A variety of roof forms mixing gables, hips and sheds further intensifies the thematic content of the architecture.